Knit fabric woes, not knitting woes. I broke up with knitting a while ago. I wasn’t going to blog about this, because it seemed like a nothing event: I was going to hem a knit skirt. Borophyll. It was going to take 10 minutes. I decided how long the skirt should be, cut the excess fabric, and pinned the hem. Then I dug out my walking foot (the preferred foot for knits) and set to work. The stitches in the top photo are even and consistent. The stitches in the bottom photo are a mess. The first thing I noticed was that the needle was striking something in the area of the throat plate. (Click here for a good diagram of a sewing machine and its parts.) Gah. I didn’t have the foot on correctly; the lever needed to be over the needle clamp. Once I fixed that, the first quarter of the hem was a breeze. At some point, however, I stopped to make adjustments, and things got ugly. The lever got stuck in the up position, and the results were a bunch of junk stitches and two layers of fabric that moved at different rates. Crunk. (I probably said worse.) Now I was left with a bunch of stitches to carefully pick out. Picking stitches out of a knit may seem like a waste of time (and it frequently is), but the fabric has sentimental value. I bought it at Mood Fabrics in New York, and I saw Laura Bennett from Project Runway season 3 at the store! And she wasn’t wearing black! Lesson learned: With a walking foot, you only can sew about 75 percent the max speed of the machine. SLOW DOWN! Lesson learned: This provided the best explanation about how walking foot feed dogs work with lower (machine) feed dogs to move layers of fabric at the same pace. 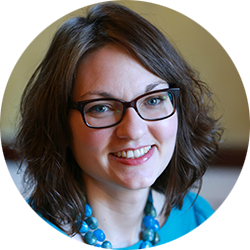 Puckers consequently are avoided — it’s like having an extra hand to guide the fabric. 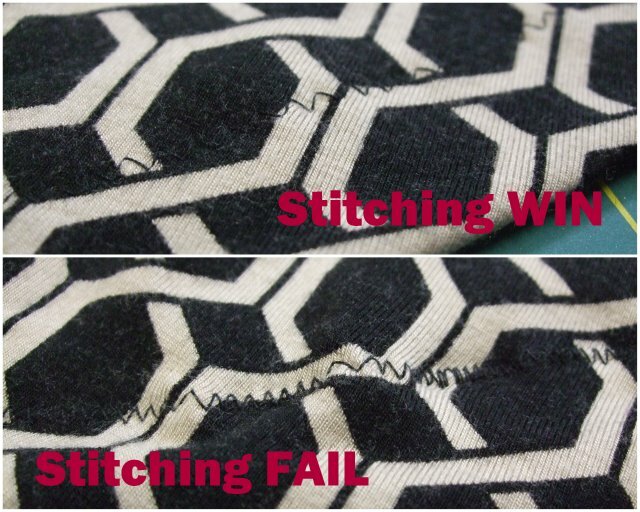 Lesson learned: This video offered the best tips for sewing with knits using a sewing machine and not a serger. Highly recommended! So what were my big take-aways from the videos? The lever must sit atop the needle clamp so the upper feed dogs (attached to the walking foot) can move fabric at the same rate as the lower feed dogs (in the sewing machine). How does that work, exactly? It’s all about the lever. The needle cues the lower feed dog rate. 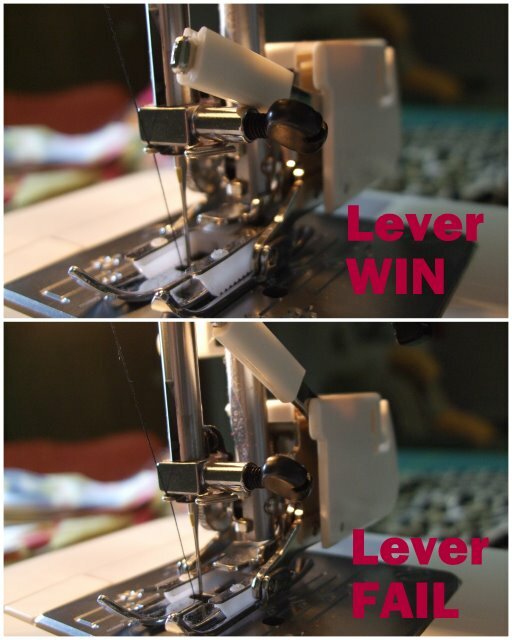 If the lever (which controls the upper feed dog rate) is timed with the needle, the upper and lower feed dogs will move fabric layers at the same speed and (theoretically) they will not shift. My problem was that the lever was not timed with the needle. When you’re sewing knits, do it slowly! Walking feet are not built for speed. I was sewing too fast. After learning these tips, I feel much more confident about working with knits. Now I just need a bit of time to pick stitches and oil my walking foot so it doesn’t get stuck again. I’ll let you know how it goes. Have you come across good sewing tutorials on YouTube and elsewhere? Please share! When it comes to sewing, I’m a visual learner. How about you?